For 25 years, the March of the Living has organized visits for adults and students from all over the world to Poland, where millions of Jews were enslaved and murdered during WWII by Nazi Germany. 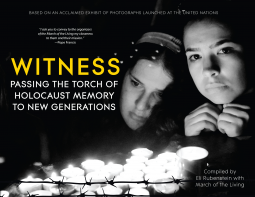 The organization's goal is not only remembrance and ongoing witness to the terrible events of the past, but also a looking forward. They want to inspire participants to build a world free of oppression and intolerance, a world of freedom, democracy and justice for all members of the human family. Rooted in a touring exhibit launched at the United Nations, this book is a compilation of photographs and text that give firsthand accounts from the survivors who have participated in March of the Living programs, together with reaction and responses from the people, young students in particular, of many faiths and cultures who have traveled with the group over the years. "I tell my story for the purpose of improving humanity, drop by drop by drop," says Holocaust survivor and March of the Living participant Pinchas Gutter. At a recent memorial event, US President Barack Obama defined the purpose of Holocaust remembrance by praising Gutter's words: "Those are the words of one survivor . . . performing the sacred duty of memory that will echo throughout eternity. Those are good words for all of us to live by." Eli Rubenstein is the National Director of The March of the Living Canada. He is a rabbi at a Toronto synagogue founded by Holocaust survivors which sponsors Passover seders for the homeless, Holocaust education programs, and award-winning documentaries. "I ask you to convey to the organizers of the March of Living my closeness to them and their mission. All the efforts for fighting in favor of life are praiseworthy and have to be supported without any kind of discrimination. For this reason I am very close to these initiatives, that are not only against death but also against the thousands discriminatory phobias that enslave and kill." This book is incredibly touching. Illustrated with photographs and quotes from Holocaust survivors, many of whom have participated in the March of The Living, this book is a factual and touching reminder of the Holocaust and the enormous suffering it caused. I received this book free to review from Netgalley for an honest opinion and I highly recommend it.